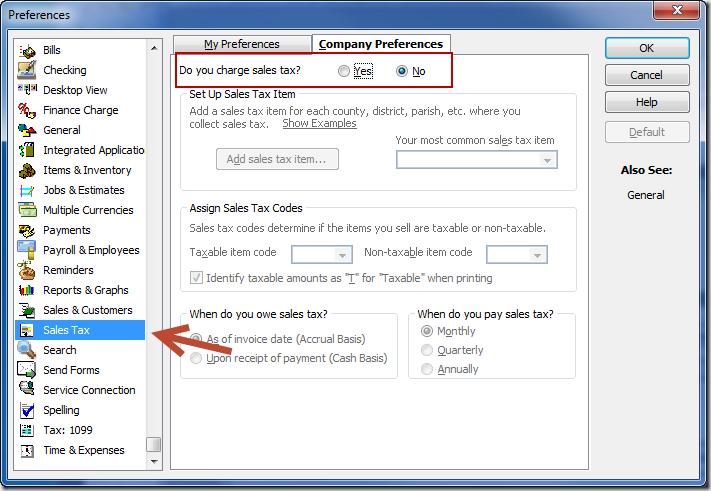 QuickBooks Insists That I Assign A Sales Tax Code–But Sales Tax Is Turned Off? Here’s a problem that a reader in QuickBooks and Beyond brought to me that I hadn’t seen before. 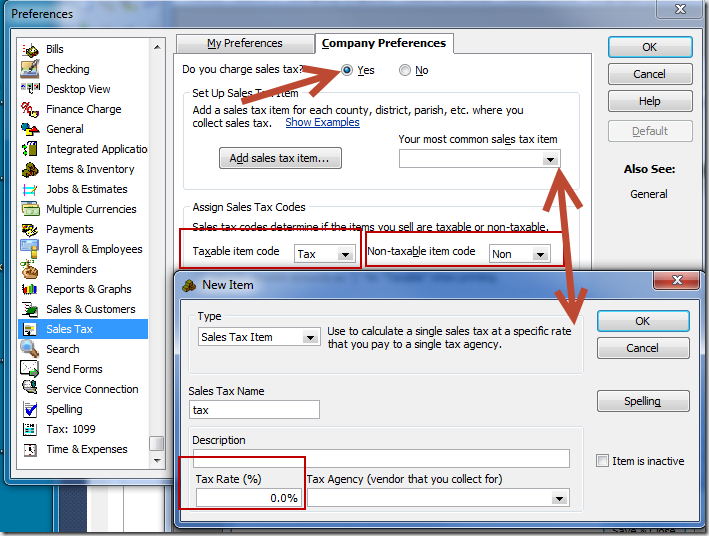 Create an invoice, and when you try to save it you get a message “You must assign a Sales Tax Code to this line item…” . QuickBooks won’t let you save the invoice until you do. The problem is, sales tax isn’t enabled for this QuickBooks file! There isn’t a way to assign a Sales Tax Code. How can you get around this? I have to admit, at first I was puzzled. The reader sent me a copy of the file, and sure enough, the sales tax preference was turned off. It doesn’t make sense! 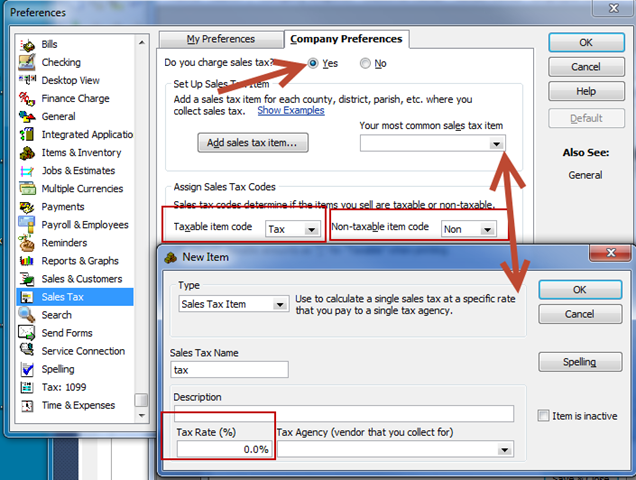 There is no way to add any sales tax related items or codes, because sales tax is turned off! Fortunately, the resolution to this was simple. The preference is just “stuck” on, and you have to “cycle” it to get rid of the message. To do this, turn the sales tax preference on. Set the two “item code” preferences. Create a sales tax item with a 0.0% tax rate (any rate will do). Click OK to save preferences. You will be asked if you want to make all existing customers and inventory/non-inventory parts taxable, uncheck those boxes (it isn’t necessary). Next, go back to the preferences, turn sales tax off and click OK again to save them. That’s it! Problem resolved! You don’t have to create an invoice or do anything else, just by “cycling” this preference the problem goes away. Thank you! I spent the last hour trying to figure this out before a search online bringing me here. THANK YOU! Whew! Thank you! Spent considerable time with no luck. Should have looked here first and will in the future. I also want to say thanks for the tip. QB really drives me nuts sometime, I guess I just don’t think like a software engine…again, thanks for solving the problem for me. Hey, thanks! I train people on QuickBooks and I was still stumped. I looked silly for a minute, but this helped. Hello, I have a Sales Tax issue that is a bit different from the ones I found here on your site. In my case, I have a customer that is set up at the customer level to be charged Sales Tax (Tax code and Tax Item are both filled). When an invoice is created for this customer, the words “Sales Tax” print on an invoice line, but the tax amount is zero. 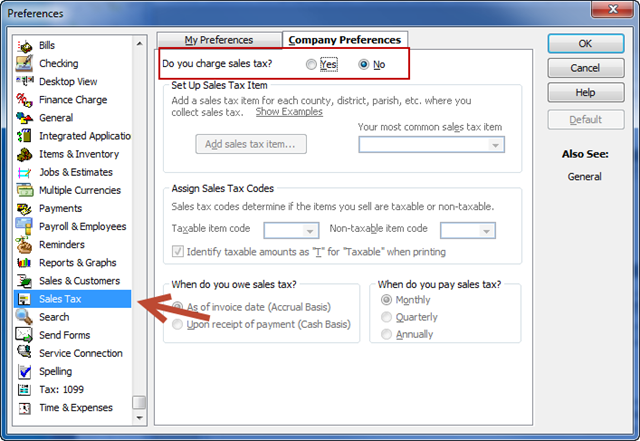 The Sales Tax description even appears (7%), but the amount is zero (0.00). I am NOT flagging each line item as a taxable item. I understood that if the Tax Code is set at the customer level, then Sales Tax would be calculated on the item total, and the line items would NOT need to be individually flagged as taxable. This problem has only occurred as of 2016; we did not have this problem last year or any prior years. Any light you could shed on this would be appreciated – THANK YOU ! For sales tax to be charged for a particular item you must have a sales tax code set for the order (as you do), AND the item itself has to be flagged as a taxable item. Both are required. That is how you are able to control which items are taxable and which are not when you have a customer with a sales tax rate. I’ve been using QBks since 1988 in a state with no sales tax. We have something else called, General Excise tax. This problem popped up out of the blue, there was no update to qkbooks or changes to the computer or issues with the computer. Qkbooks just decided to give me a hardtime. Thanks for the tip on resolving this!